MOSCOW, April 13. /TASS/. Russian businessman Alisher Usmanov has filed a slander lawsuit with Moscow’s Lyublinsky district court against opposition activist Alexei Navalny, the court’s press service told TASS on Thursday. "Usmanov’s slander lawsuit against Navalny has been indeed filed with the Lyublinsky court. The court will decide on initiating the proceedings within 5 days," the court’s press service said. According to the case files, the lawsuit was registered by the court on Wednesday. Navalny’s nonprofit organization, the Anti-Corruption Foundation, is also a defendant in the case. The court’s spokesperson refused to give more details until the court’s decision. In an interview with business newspaper Vedomosti, Usmanov, who is Russia’s fifth wealthiest man under the rankings of news agency Bloomberg with an estimated fortune of $14 billion, said he considered real estate operations mentioned in the opposition activist’s accusations as commercial deals and not as a bribe. Usmanov said he would file a slander lawsuit with a court of Russian jurisdiction against Navalny but was also ready to sue him in foreign courts, if necessary. The businessman earlier said in an interview with TASS that Navalny had crossed the red line by accusing him of crimes. In a new interview, the businessman said that the lawsuits would also include Navalny’s other accusations. A video posted by Navalny’s Anti-Corruption Fund in early March claimed that SotsGosProyekt Foundation whose supervisory board is chaired by Ilya Yeliseyev, a former classmate of Prime Minister Dmitry Medvedev, had received a land plot together with an estate in the village of Znamenskoye on the Rublyovskoye highway outside Moscow from Usmanov under a donation agreement. Navalny said that the property transfer to the SotsGosProyekt Foundation was a bribe as the real estate was subsequently used as the prime minister’s residence, according to the politician. Usmanov said in his earlier interview with Vedomosti that the house on the land plot in the village of Znamenskoye that was the subject matter of the deal had been built for his sister Gulbakhor but she refused to live there. As part of the deal, Usmanov exchanged the plot of land together with a ready-made house in the village of Znamenskoye for another land site - in the village of Uspenskoye close to the businessman’s house. SotsGosProyekt Foundation and the East Invest Group planned to implement a development project on that plot. According to Usmanov, the donation agreement mentioned in the allegations was part of a complex commercial transaction on acquisition of the plot neighboring his land estate. As a result of the transaction, SotsGosProyekt Foundation and the East Invest Group, which had the agreement on joint operations on that plot, dropped plans of building mansions and sold the land plot to the businessman. Under the deal, the East Invest Group received money and SotsGosProyekt Foundation received the plot and the house in Znamenskoye, owned by Usmanov’s sister before. That is why this deal has several stages and several parties, Usmanov’s press service said. 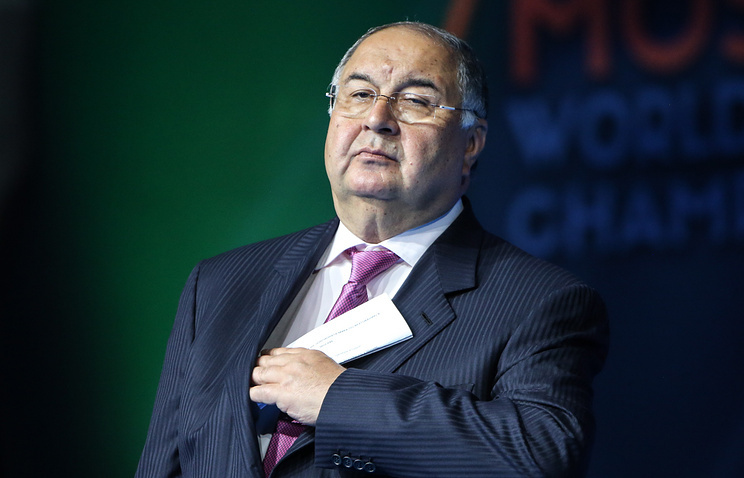 Usmanov is the biggest shareholder of USM Holding Company, which controls Metalloinvest metals giant, MegaFon cell phone operator and the Mail.ru Internet Company. The businessman also owns large stakes in UTV Holding and CTC Media, and also the Kommersant publishing house and over 30% of shares of English FC Arsenal. Usmanov is also actively investing in foreign hi-tech assets, such as Xiaomi, Uber, JD and others.